So not only is this my first Craftster Challenge, but it's my first post too! I've been a bit of a board stalker... >.> shh. 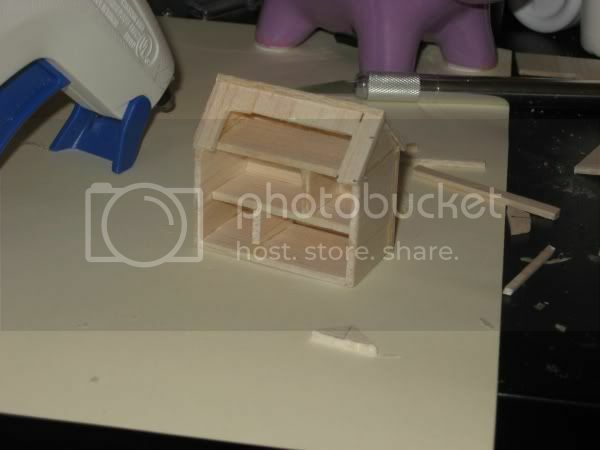 Anyhoo, I really loved Kappy's "Home Sweet Home" entry from last challenge (https://www.craftster.org/forum/index.php?topic=111622.0), and it inspired me to make a tiny doll house! It includes wallpaper, an unfinished attic (like most attics are), and a teensy sofa and bed crafted from wood scraps and toothpicks! I made the shingles by cutting little notches out of strips of paper and laying them out like real shingles are. Unfortunately my camera didn't do a good job at capturing the texture of them, but they look like real shingles I swear! I was a pretty girly little girl, and loved my dolls so I enjoyed some reminescing through out the project. I hope you all like it!!! 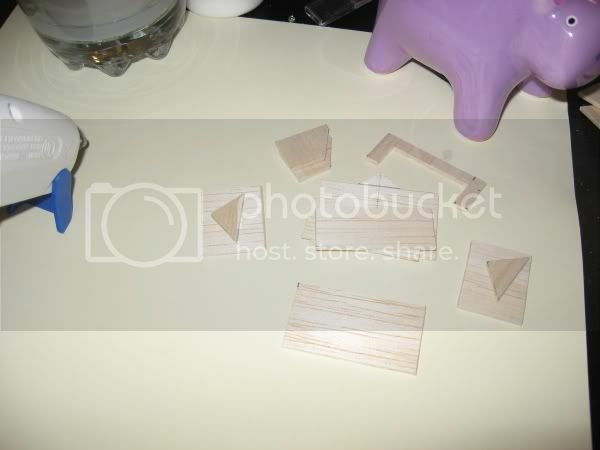 Cut out bits of balsa wood! I ended up purchasing an obscene amount of it... anyone need some extra wood? Here we are after assembly... and after prying apart my hot-glued fingers. Holding my disaster piece of art after gluing in some wallpaper and adding the finished furniture! So fun! 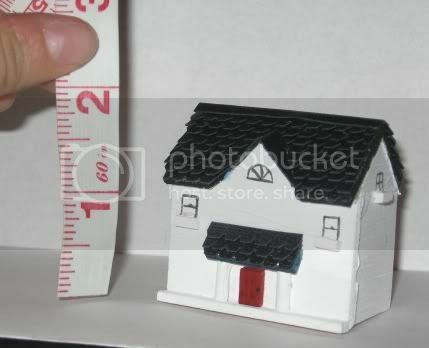 I love the shingles, and that it works like a real dollhouse from the back and all. i am becoming a board stalker too! but im slowly starting to put comments here and there. love your little house. 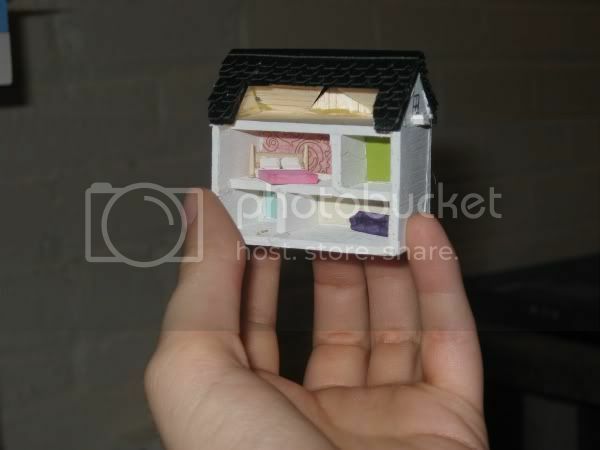 its the dollhouse i always wanted but family was too poor to afford it! love it. Holy cow - that's awesome. 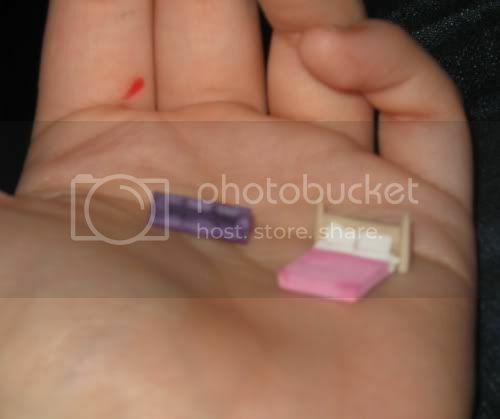 Those teeny little shingles are amazing. 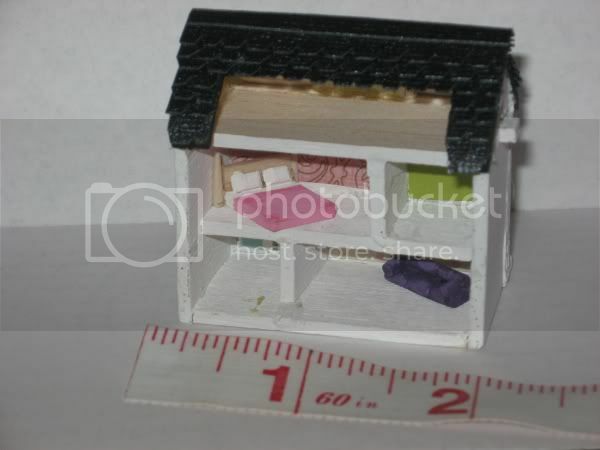 When I saw the first picture I thought making such small shingles must've been a pain, and then I saw that you even did the open back and furniture. You have big tiny-talent! Thanks everyone for all the positive feedback! ^_^ It means a lot! Hehe and it's funny you mention that. I actually made two little carved tooth pick "dolls" but it was so difficult to paint on facial expressions... they ended up looking more like mini blow up dolls with that odd wide-eyed open-mouthed stare >.> hah so I left them out. This is just stunning! 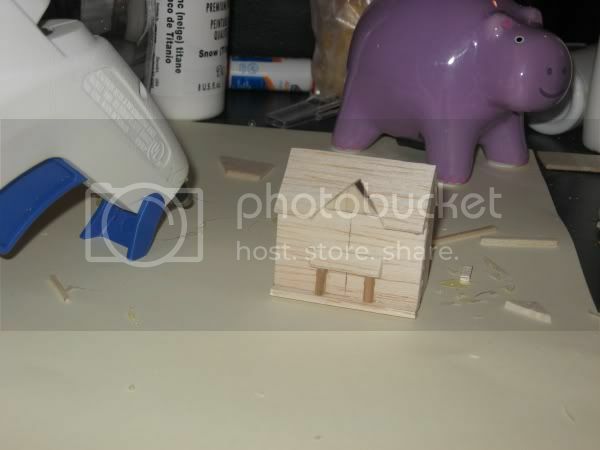 You're entire house is smaller than any single miniature I've ever made!